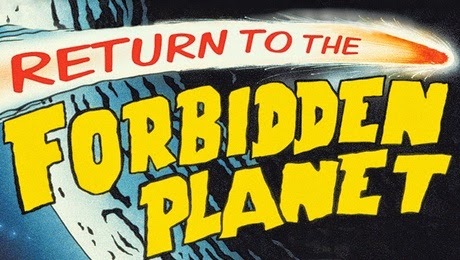 Return to the Forbidden Planet lands in Glasgow next February! 25 years after Captain Tempest and his crew first journeyed into hyperspace, and 14 years after the last UK tour, Olivier Award-winning rock spectacular Return to the Forbidden Planet is back and exploding onto stage in a major new 25th Anniversary production, playing at the King’s Theatre Glasgow from Monday 9 to Saturday 14 February 2015. Inspired by Shakespeare’s The Tempest and packed with rock n’ roll classics includingGreat Balls of Fire, Good Vibrations, Heard It Through the Grapevine and Born To Be Wild,Return to the Forbidden Planet is a musical of meteoric proportions that will be remembered for light years to come. With stunning special effects, a brilliant cast of actor-musicians, a mad scientist, a huge green-tentacled monster and a rock ’n’ roller-skating robot, your in-flight entertainment is guaranteed! So fasten your seatbelts, set your ray guns to stun and prepare for blast off!